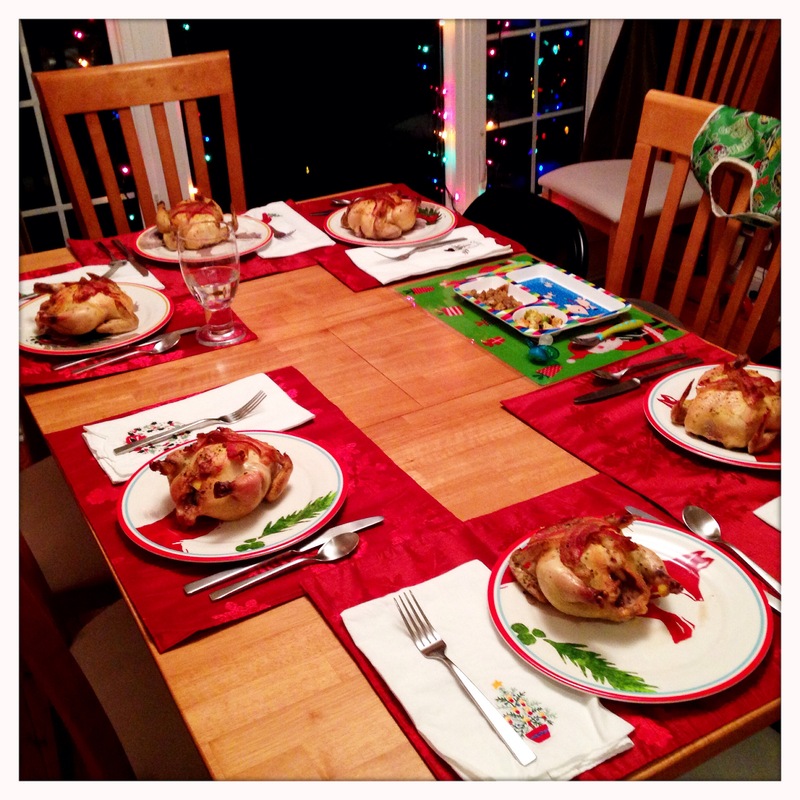 For the next installment of my Christmas dinner retrospective, I’ll be tackling the main course – cornish game hens. To clarify, these are full-grown small chickens, not baby chickens. This particular species of chicken only grows to about 1 1/2 lbs, which makes them perfect for whole bird presentations on each plate at a special meal. 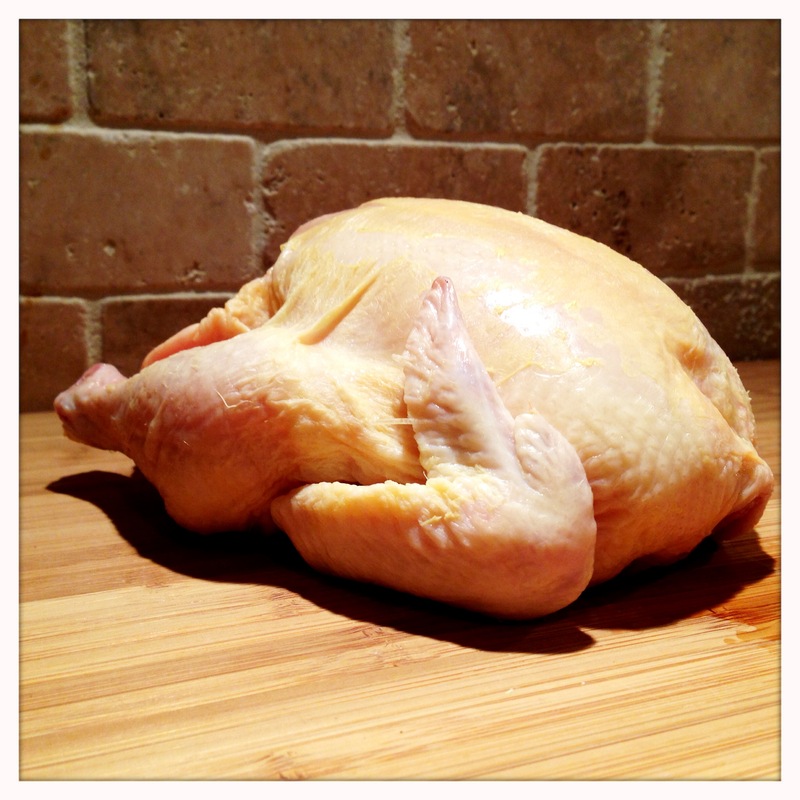 The meat is very flavorful, but is all “white meat” including the thighs and legs. So, while they have a very rich chicken flavor, they do not have any of the dark meat flavor that many people seem to be turned off by. The birds can be split in half for smaller appetites, but I prefer the presentation of the whole small bird on the plate, and this is a reasonable serving size for most adults. Preheat your oven to 400 degrees. Place a rack into a roasting pan large enough to accommodate your hens. Rinse the birds thoroughly and pat dry. Remove the packet gizzards and any other items inside the birds. Next we will add some aromatics to the cavity to impart some flavor while roasting. With birds this small, I don’t like to cook stuffing inside the cavity. The cooking time is much shorter than a turkey or even a large chicken, and it’s tough to ensure the stuffing will reach a safe temperature for a long enough period of time. Instead, I prefer some fresh ingredients that will add flavor while cooking and then can be discarded. 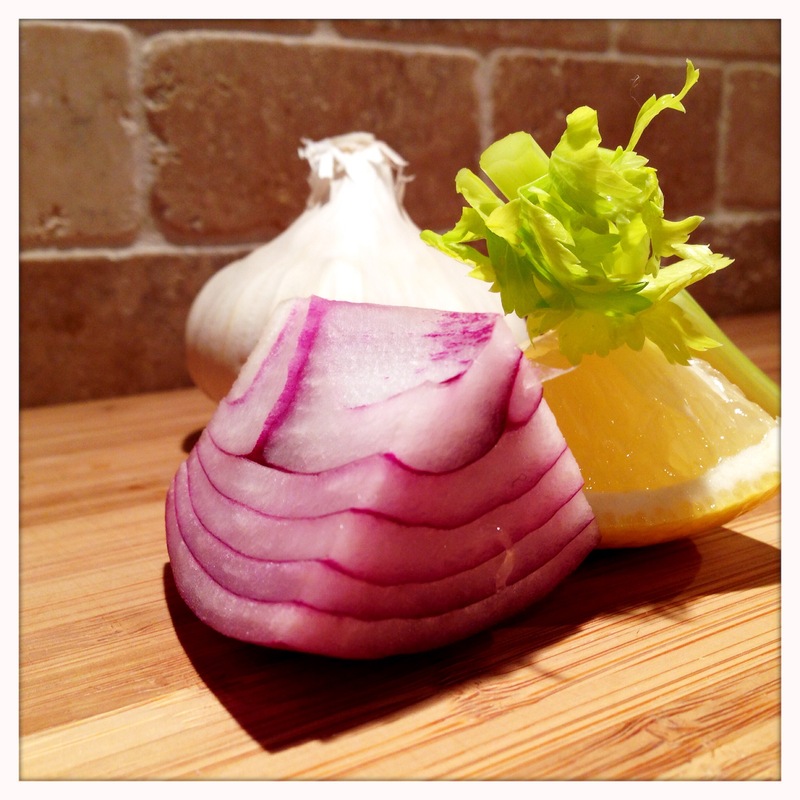 For this, I use a small stick of celery, a wedge of lemon, a wedge of red onion and a gently crushed garlic clove. For the garlic, peel a single large clove and lay it on your cutting board. Lay your knife flat over the glove and apply gentle pressure to just ‘pop’ the clove without completely crushing it. Place one piece of celery, one lemon wedge, on onion wedge and one popped garlic clove in each hen’s cavity. 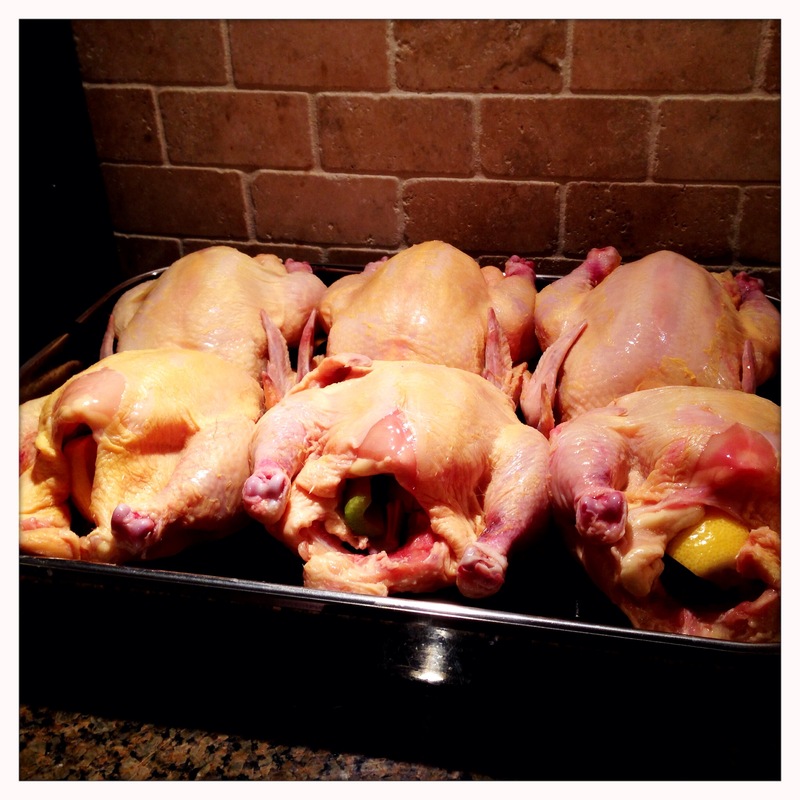 Then place the birds on the roasting rack, breast side up. Pour at least 2 cups of chicken stock in the bottom of the roasting pan along with any leftover garlic, onion and celery. 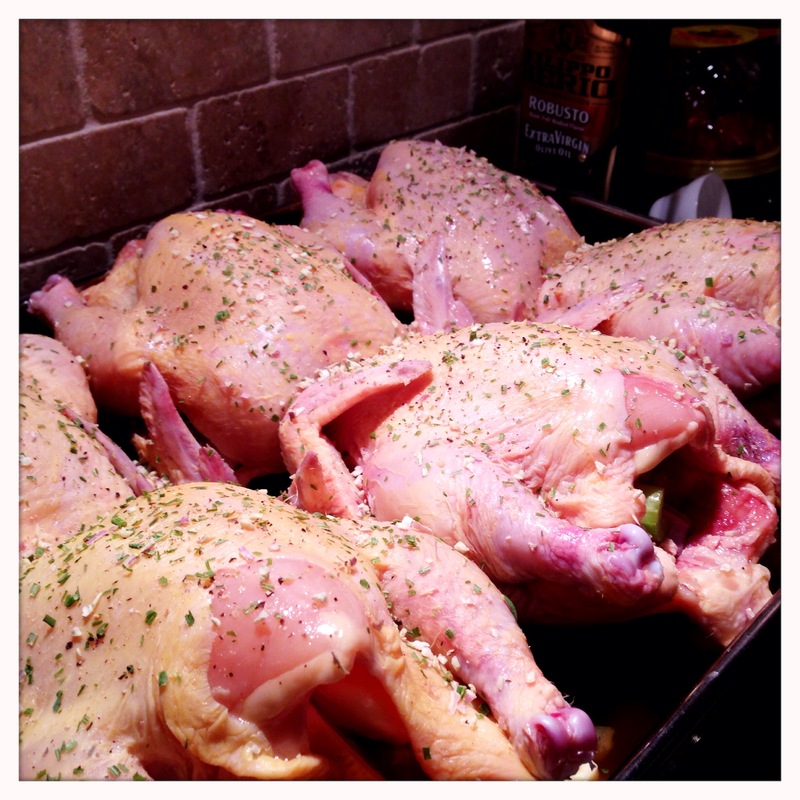 Rub the hens with a bit of butter, and season liberally with salt, pepper and the herb blend of your choice. I use a blend called Sunny Paris made by Penzey’s, which has a nice bright flavor. This blend was also used in the stuffing posted earlier this week. 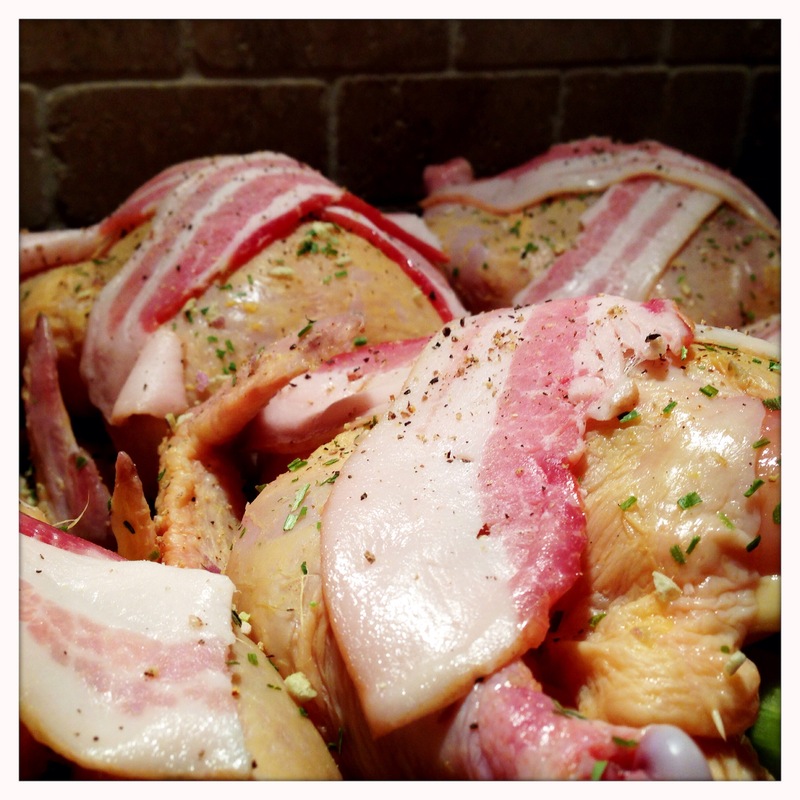 After seasoning the birds, we’ll add the bacon. Cut your six slices of bacon in half, and lay two half slices over the hens. Add a little more pepper and herbs over the bacon slices. 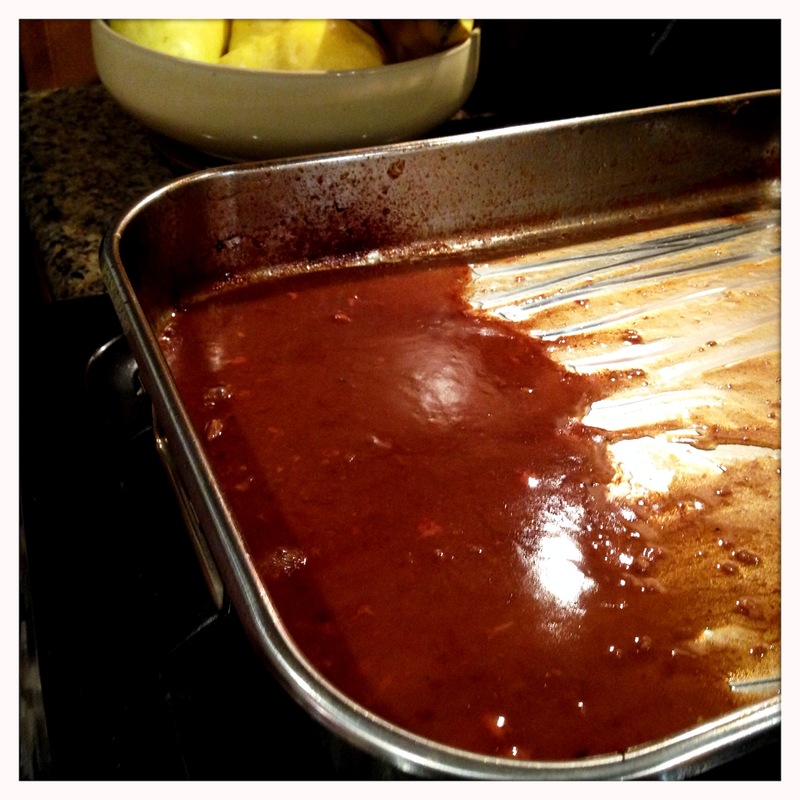 Place the roasting pan in the preheated oven and roast for about 45-60 minutes. Roasting time will vary depending on the size of the hens, the number of hens you’re roasting and the individual characteristics of your oven. I recommend starting to check for doneness with a meat thermometer at about 45 minutes. Cooking six birds at once took just over an hour to fully cook through, but a smaller number will cook faster as there will be more room for air to circulate around the hens. Remove the rack from the pan and let the hens rest for about 10 minutes prior to serving. While the hens are resting, we will make use of the drippings that have fallen into the chicken stock to make a gravy. The birds are small, and they will be plenty juicy, but the gravy is great on stuffing and mashed potatoes. Due to the bacon drippings falling into the stock, the gravy will have a rich, smoky flavor despite the shorter cooking time of the small hens. Place the roasting pan over two burners, and turn them both up to medium-high. Bring the gravy up to a boil and stir continuously. As there is already celery, garlic and bacon flavoring the stock, I don’t add any additional salt or seasoning to the gravy, but you can adjust to taste. Continue simmering until the gravy reduces to your desired consistency. Many people add flour or starch to thicken gravy, but I prefer to do it the old fashioned way by reducing simmering off as much water as I can until I have a nice thick gravy. 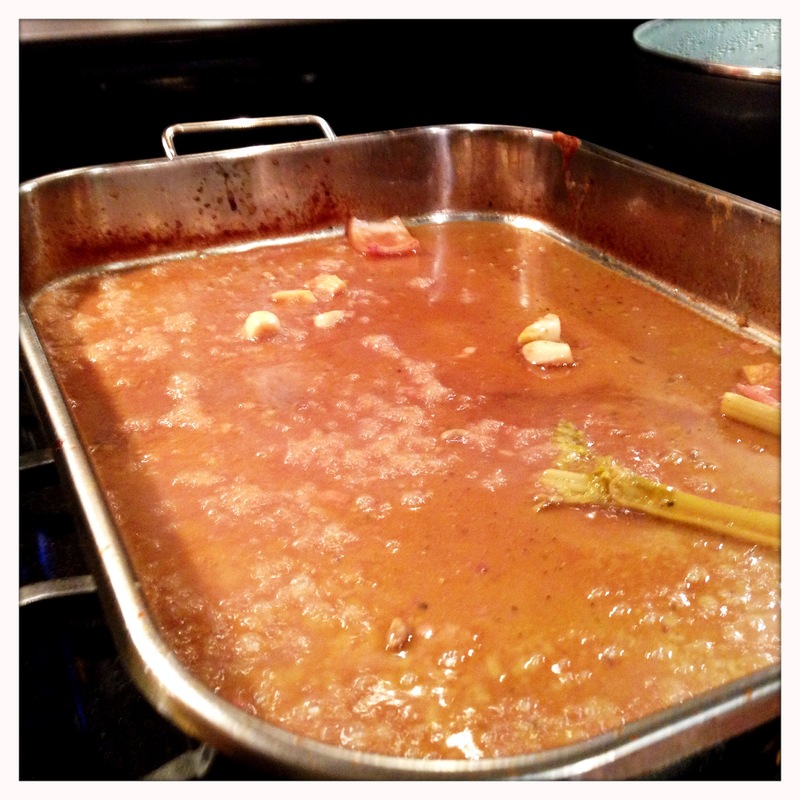 If you don’t have enough gravy, add more stock and reduce again. Thickeners will save you time, but the clean, rich flavor you get by simmering until thick is worth the work and the wait. 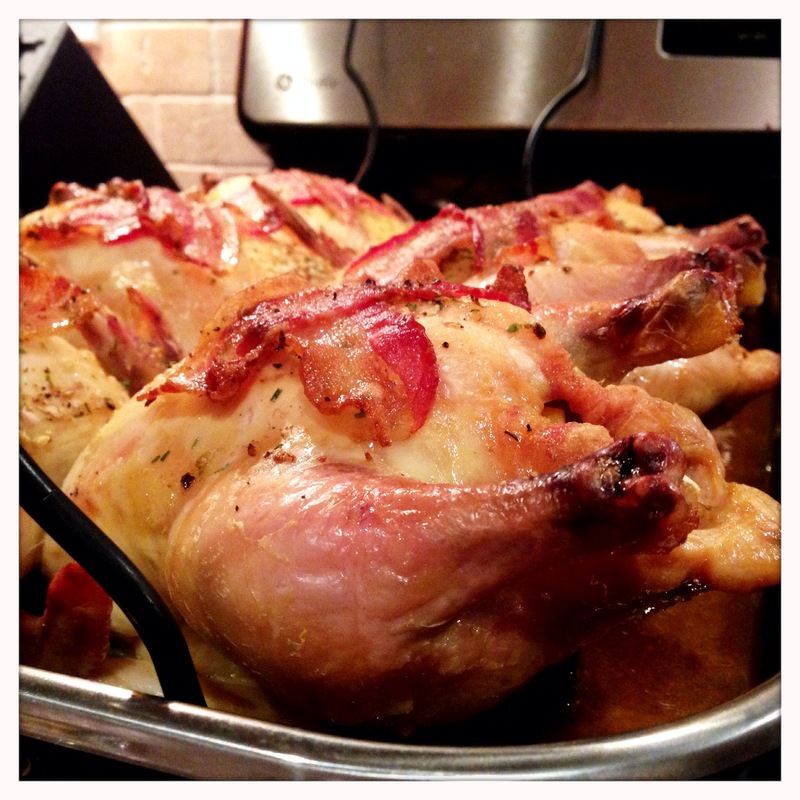 Place a hen on each guest’s plate, and serve up your sides family style or on a buffet. The meat is tender, and you will have no trouble carving up your hen right on your plate as long as you have a nice sharp knife. You should certainly slice up chunks of meat for younger eaters, even those old enough to use a knife, though to avoid any accidents. 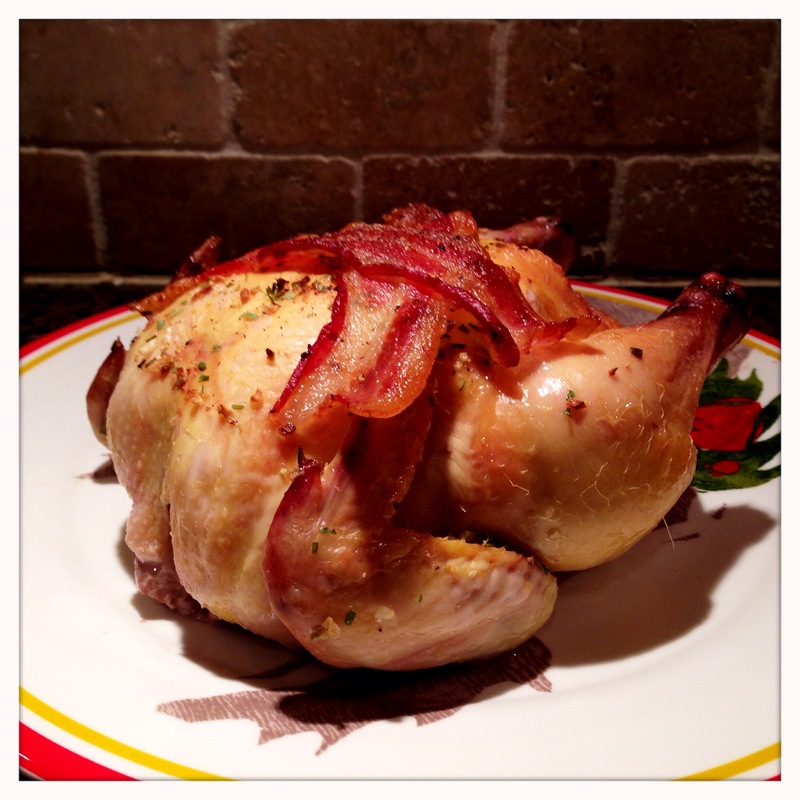 If you’re looking for something a little different for the holidays or a special occasion, a cornish hen is a wonderful dish to try that is both unique and familiar at the same time. Enjoy!